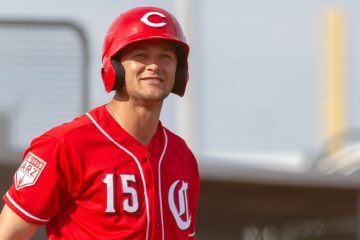 How does Nick Senzel project in 2019 for the Reds? If there is one prospect that projects to see real time on the field for the Cincinnati Reds in 2019 it’s Nick Senzel. The organizations top prospect hit .310/.378/.509 last year in Triple-A Louisville. Of course, his season ended early due to a finger injury. The injury required surgery and caused him to miss all of July through September. Once he had recovered he joined the Reds in instructional league to start taking fly balls in the outfield. The plan was to then send him to the Arizona Fall League to continue learning the outfield. That plan didn’t work out, though. Nick Senzel wound up getting surgery to remove bone spurs in his throwing elbow. Since his recovery he’s been working in Goodyear, where he’s stayed all offseason, working on learning to play in the outfield. Exactly where Nick Senzel fits into the lineup isn’t the easiest thing to figure out. At the two positions he’s seen the most action at, third base and second base, he’s blocked for at least 2019 by two All-Star players in Eugenio Suarez and Scooter Gennett. That’s why the Reds have explored the idea of trying him in the outfield. The bat is ready, and it would be an improvement to the everyday lineup. So they are trying to find a way to make it work. Yesterday saw the ATC Projections released over at Fangraphs. The system is one of many projections that will be rolling out as we get closer to the regular season. For Nick Senzel, the system projects him to hit .276/.344/.468 with 20 doubles, 2 triples, and 10 home runs in 85 games played. The .792 OPS it projects for him would be good for 6th best on the Reds. The system thinks the Cincinnati offense is going to be pretty good. That would be a solid rookie season at the plate for Nick Senzel. How does that stack up to some other top prospects in baseball? Using the just released Baseball America Top 100 list, I found the 10 top hitting prospects who had projections listed with the ATC Projections and more than 100 plate appearances in their projections. That took us from the top prospect on the list, Vladimir Guerrero Jr. down to the #31 overall prospect on the list Luis Urias. The chart is sorted by OPS. Nick Senzel stacks up quite well and is near the top. The power difference between the top two guys, and Senzel, is what has them separated into their own grouping. Of course, that list is only looking at hitting value. There’s no baserunning calculation involved, and there’s no defensive assessment, either. Those two things are pretty important to the overall value of a player, of course. For Nick Senzel, he’s above-average at both if he’s playing on the dirt. In the outfield we simply don’t know enough to say. What we do know is that, offensively, he should be able to contribute quite a bit to the Reds lineup. Figuring out how to get him into that lineup, though, will be the question of the spring. Question for staff or anyone else. The assumption is that DeSclafani will be the #5 starter. What separates him from Mahle? Age? Stuff? Both have been off and on. I think its a combination. They can keep Mahle down and let him start in AAA, Disco can’t be anywhere other than the majors. Also Disco at his best is a really good pitcher. The half season or so before his UCL tear or whatever I believe he came back and pitched really well. I think those are the main two reasons. I also really wouldn’t worry about who our starting 5 is and the other 2 or 3 who don’t make it out of spring because it is extremely unlikely that all 5 will be healthy for 162 games. I would imagine that atleast 7 pitchers will get a decent amount of innings between them. his past success at big league level. In 16 before injuries he was pretty good and had tons of upside- then he got hurt- and this will be first full season of supposedly being healthy since then and he’s 28- so heart of his prime. Good to give him chance to start season if he earns it. Performance. Even in 2018, from a peripheral standpoint, DeSclafani stood out even if his ERA didn’t. Essentially it was the walks. Mahle had a fairly high walk rate, while DeSclafani didn’t walk anyone. Similar strikeout rates, similarly high home run rates. Toss in that DeSclafani’s got a track record in the Majors, and well, that’s your answer. Yeah I was kinda shocked when I saw his 2018 stats compared to 2016. Pretty similar despite the yuge difference in era. Maybe got a little lucky in 2016 era or just very unlikely last season. He’d be my opening day starter if gray didn’t sign that extension- still a maybe even w that. Get the vets rolling against a much more experienced team when facing bottom of rotation. Beating brewers and cubs is yuge for reds ! https://www.baseball-reference.com/players/d/desclan01.shtml another big difference between 2016 (good) and 2018 (not so good) was # of HR he gave up. That resulted in more R and ER being given up. Must stay healthy in 2019. 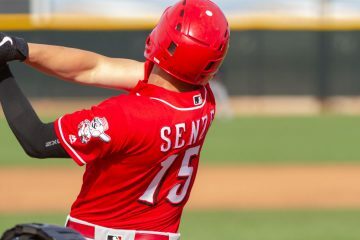 Outside of Senzel and where he fits into the line-up, DeSclafani might be the biggest question mark for the 2019 Reds. Given this injuries and then length of time it’s been since he’s seen a season in which his peripherals AND actuals impressed, i’m expecting a pitcher who would slot in at #4 in most rotations. But the optimist in me is still holding on to hope that he could be the #2 he showed glimpses of in the past. Or he could see single digit starts and end up back on the 60-day DL. haha. The range of possible outcomes for him is larger than any other Red. Only thing senzel has to prove is that he can stay healthy. I bring him up as soon as service time is saved and get him a mix of center/second/a little 3rd. Ease him somewhat into bigs and not overwork him. Maybe 3/4 starts a week at first and build his work load up for a playoff push toward end of season. He has the potential to add as much value as any other acquired player not named Puig. So you think he can add a bunch of value, but you want to use him 3-4 times a week? Doesn’t that seem a little bit backwards? Wasn’t Senzel’s elbow his NON-throwing elbow? Let’s say Nick plays CF and plays it well. Is this just a one year thing if Gennett is not retained after this season? Doug do you think if this works out he could stay at CF? I think he moves off center no matter what. Siri/Trammell/Friedl (to a lesser extent) will be pushing. So if Scooter goes, 2B. If Scooter stays, He goes to RF/LF opposite Winker. For this reason I would bet that they move him around some even if they don’t have to. Keep him logging some innings on the infield to ease a possible flip back. I gotta believe that barring injury, he will play a lot more than 85 games just not sure where he will be playing but my guess is all over the field. CF, 3B, 2B, maybe even a few at SS. 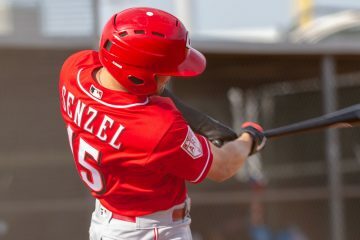 Unless Suarez or Scooter gets injured or traded I foresee Senzel playing most of the year at 2b/3b in AAA. If that is the case they should have traded him for Kluber because he is not as good as MLB teams think he is. The only time he spends in the monors is at the beginning of the year to get another year of control. I am a big believer in resting players. No player should be approaching 160 games. With 3 OF positions, and 4 IF positions, that = 1134 starts. That allows you to have 8 players starting an avg 141 games a season. We currently have 9 guys who deserve playing time, which would equal 126 games. I think that number would be too low if all remained healthy (which won’t happen). Until injuries change things I’d start the best 8 guys (not Schebler) in those 7 positions equally, allowing obviously for matchup. That would, on average, give a player 7 days on, and 1 day off out of 8 games. We have some versatile players to make it happen. I think .276 is a little low. I’ll also be a little surprised if Vlad Jr doesn’t hit over .300. Wait 2 to 8 weeks depending on how Schebler looks in CF and unless the OF is all hitting bring him up to be CF and whenever we need to spell Suarez or Scooter, get him starts at 3B and 2B. 2020 Senzel’s our starting 2B, take the $10+ million a year it’d take to sign Scooter into his 30’s along with the Roark and Wood money and sign Chris Sale to a 4 year $140 million deal. Gotta think Sale will command a 6-year deal worth at least $30 million per year. He has been worth 5, 6, and 6.9 bWAR from 2016-2018 seasons. Even with regression you would think he’d reach 24 WAR in 2020-2025 seasons. I’d be shocked if it doesn’t take $200 million to sign him after this year. Add in the GABP effect and that he’d have to want to come here, and I’d say it’s a long shot that the Reds sign him. I have to agree it’s a fantasy. I went less years, but up to $35 mil a year. I enjoy throwback uniforms, so I don’t want Chris Sale. Also it must be a pain to have to hide all the scissors in the locker room. .792 OPS as sixth best on the team is caliente. However they get ordered a six of Winker/Senzel/Puig/Votto/Gennett/Suarez is going to be fun to watch. Hi Doug. I always enjoy your articles/insight, be it here, redszone, Redlegnation, or The Athletic. Being a Reds fan but living in Cards and Cubs land, any information or Reds related news is of great value. About Nick, like everyone else, I’m extremely excited at the thought of 2019 being the year he helps the big club. On that note, and to true up my perspective, I wanted to get clarification on the projected ops. You’ve indicated a slash line of .276/.344/.468 yielding an ops of .792. Should this be .812, or am I using bad math? If .812, does that move him up the scale in team ranking from #6? While no one has said it to my knowledge, I think, lacking a better option, Ervin and Williams platoon in center. With that in mind, regarding where to play him, do you think Nick starts the year in AAA in consideration of service time and to give the team time to assess the platoon? Does he come up as soon as he passes service time concerns? Or does he make the club out of spring training while waiting for an opportunity or suitable trade partner to create an opening? Cool, thanks. Wasn’t trying to be a numbers Nazi,-hope it didn’t come across that way-just wanted to confirm which was correct. As Duke stated, the .276 avg projection seems low. Of course we don’t know what it will be but even if he hits a few points higher, there’s a good chance he finishes with an .800+ops. If that happens, Winker stays healthy, and Puig does what he does, it’s not too far-fetched to think we could have 6 lineup regulars with >.800ops. ~15 years ago we had a heckuva an offense. How many times did we say then- ‘If we only had some decent pitching…’ With the new rotation and this offense’s potential, could be a fun year. The first thing I think of when a top line FA pitcher is mentioned is GABP. It is a major factor. If one watches The MLB Network(any time or any program)underneath the screen is a moving ribbon of words with the latest updates. If nothing is breaking at the moment they put up lists of the unsigned free agents. The three that are up for Seattle are Zack Duke–Cameron Maybin -Adam Warren. Any (or all of them) would be good pick ups for the Reds. As time moves on their costs would be even more reasonable. Maybe even on minor league contracts. A lefty for the bullpen–a CF to fill the void until a Trammell/Siri are ready–and a solid bullpen guy to give depth to the team.This could be done and not break the bank and give the new manger lots to fall back on. Maybin had a .336 SLG% with a .662 OPS last season. He’s either average (0 Rdrs in CF in 2018), or slightly below average in CF (-11 in 12 seasons) based on defensive runs saved. Not sure how he’s a better option than Ervin or Schebler (1 Rdrs in 2018 in CF) in CF defensively and he’s certainly well below any of our options on offense. I could see the Reds signing Maybin, but I think his role would mostly be defensive replacement. My preference for CF is either of former top 100 prospects, Dalton Pompey (trade w/Blue Jays) or Dustin Fowler (trade w/Athletics). Both are likely blocked and could also fill the role of defensive replacement, but have the upside of being more. I think either pitcher you mentioned could be a target, but at this point, neither are absolutely necessary. Reds are in a good position to wait for value to address both areas. The Reds have named Rolando Valles associate coach on the staff. I imagine he will fill the same roll as Darren Ehbert last year, left-handed Batting Practice Pitcher. He also interacts well with Latin players, helping them adjust to MLB (and MiLB) in the USA.